You are here: Home / Our Animals / Chickens / Does The Deep Litter Method For Chicken Coops Really Work? Does The Deep Litter Method For Chicken Coops Really Work? The deep litter method for chicken coops is pretty controversial among backyard chicken keepers. So what is the “deep litter method”? Some owners think it’s unsanitary, while others swear by it. In this article, we’ll take a look at the advantages of the deep litter method. I invited my friend, Liz Martin of The Cape Coop to write an article for y’all. Liz is a deep litter method expert, and uses it in her chicken coop – and swears by it. 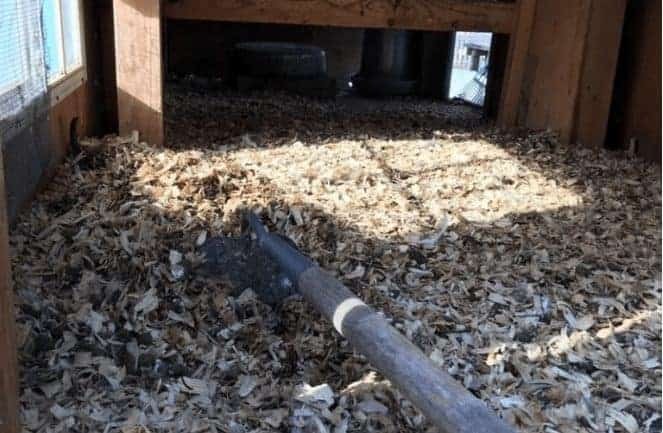 What if I told you there is a really easy way to maintain your chicken coop with LESS cleaning that is actually healthier for your chickens? I know, I was skeptical at first, but the more I researched deep litter, the more it made sense. Now two years after we started deep litter I am never going back! Deep litter coop maintenance is all about balancing the beneficial microbe levels to allow the manure & litter to compost right in the coop. Done right, it allows for far less coop cleaning chores, a healthier flock, a warmer flock in the winter and rich garden compost. Done incorrectly it can make your flock sick and your yard really smelly. 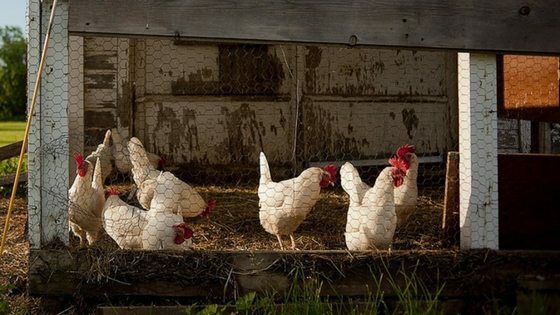 Initially, I was concerned that allowing all that manure to build up in the coop would make it very unpleasant to spend any time outside, particularly in the hot, humid summer months. Luckily, I have found that properly managed deep litter only has an earthy, composty smell. If you smell ammonia from the droppings, that is the first sign your litter is out of balance. This is the benefit that gets most people hooked! Deep litter takes just minutes a week, plus one or two optional big clean outs a year. What you can’t see in that pile of chicken poop in the coop is that microscopic organisms are hard at work breaking down the droppings. The great news is that these beneficial microbes will also eat and destroy bad bacteria that can make your flock sick. Your job as a chicken owner is to make sure the bad guys don’t outnumber the good guys. The presence of these beneficial microbes has been show to help prevent infestations of lice & mites. They also can help protect your flock from coccidiosis (a potentially deadly intestinal parasite). The microbes will destroy the coccidia bacteria that form, but also the slightly higher ammonia levels present in deep litter coops makes for unfavorable coccidia growing environment (common coccidia treatment includes spraying with a 10% ammonia spray). It is also thought that exposing young chicks to deep litter will help them form additional immunities for an overall healthier flock. Chicken manure is very high in nitrogen, add in pine shavings loaded with carbon, oxygen you are introducing as you turn the manure over, and some hungry microbes breaking things down and all that decomposition action will produce some heat! Deep Litter coops are generally about 10 degrees warmer than traditional coops. This is a plus for cold weather chicken keepers, but something you also have to be aware of during warm months so your flock doesn’t overheat. Having proper ventilation in your coop is vital when you are using deep litter. Ventilation will not only keep the temperature comfortable, but it will also keep the ammonia & humidity levels down. Ammonia is very bad for chicken lungs, they can have (potentially fatal) respiratory complications if the ammonia levels build up in the coop. A good clue that you do not have adequate ventilation in your coop is if you see condensation building up on the coop windows. Click here to read my tips on designing your coop. High humidity can be particularly bad in winter months as it can leave your flock susceptible to frostbite. Because chicken manure is so high in nitrogen, it will burn tender vegetation if you don’t let it age first. I generally let my chicken manure compost sit 6 months before I add it to my garden. The tricky situation with deep litter is that at coop clean out time, you will have 6 month old manure but also brand new day one manure. So at coop clean out, you still need to add everything to the compost pile to age, but when you do, you are adding materials that already have a rich microbe community that has been monitored and well feed as a starter culture for your pile. When you add this material to your existing compost, it will enrich the whole pile, making for some great garden food! I already mentioned the trick to deep litter is making sure the bad guys don’t outnumber the good guys. It’s really not as hard as you might think, but there is some work involved. If you were to just let the droppings build up untouched for 6 months, the bacteria would far outnumber what the microbes can consume, everything would be damp & humid, ammonia levels would be off the charts…..all recipes for a very sick flock (and a very smelly coop!). To start your deep litter coop, completely empty and scrub down the coop to start with a fresh slate. Add a layer of pine shavings, about 3-4 inches deep. Pine shavings work great because they are cheap, and they decompose nicely and quickly. Some people use straw or hay in their deep litter coops with success, but I worry about mold lingering in damp straw. Twice a week, use a hoe to completely stir up all the shavings & droppings. You can get your chickens to help with this part by tossing scratch or treats into the coop that they will have to scratch around to find. You will still want to be in turning it yourself at least once a week so that you can access the condition of the shavings. The shavings should look dry & absorbent. If they are muddy or starting to look caked on, the balance is off and you need to add more shavings. 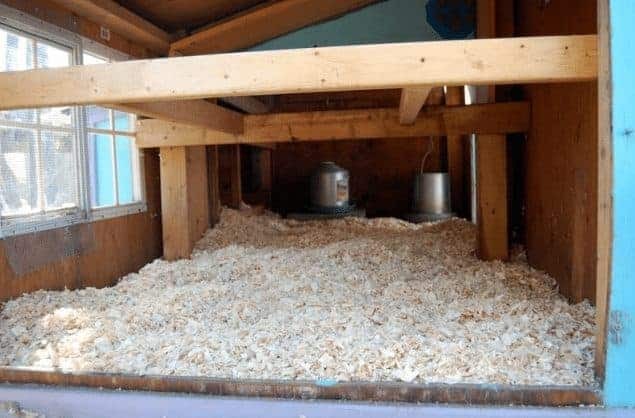 Depending on how many birds you have and how big your coop is, you might have to add shavings once a week. At the very least you should aim to add at least a 1 inch layer of shavings monthly. An optional step (but one I have found to be really helpful if the ammonia smell is starting to build up) is to add some “Coop N Compost” by MannaPro. Made with naturally occurring zeolites, it helps hasten composting and neutralizes excessive ammonia (and no I am not being paid by them, I just really love their product!). That’s it! It really is an easy way to maintain your coop. When the shavings start to build up too much (this will be different for every coop, but I usually do this when they get about 6-8 inches deep) you can pull some layers off the top and put them in compost. Twice a year, I completely empty my coop, scrub it down and start over. Click here to read about how I deep clean my coop. There are lots of people that use deep litter that never completely empty their coop. They just keep stirring up the shavings and pulling out the excess. The thought is to keep the bottom “hot” layer of decomposition to help act as a starter culture to jump start future new layers. 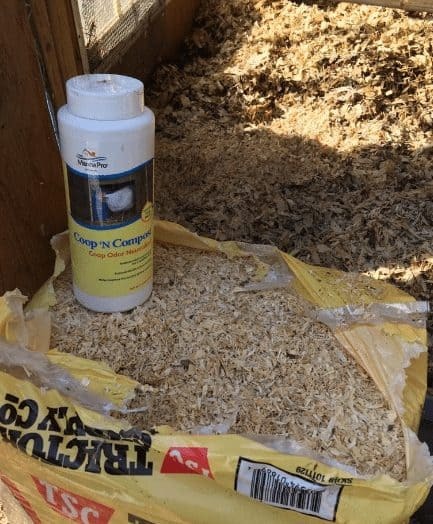 Would you try the deep litter method in your chicken coop? Why or why not? Leave a comment below! Does The Deep Litter Method For Chicken Coops Work? The deep litter method for chicken coops is pretty controversial among backyard chicken keepers. Here's why you should consider the deep litter method! yes! We do it and it works amazingly well. 😉 We tarp the run in the winter as it’s rainy/windy in the Pacific Northwest. Make sure you have adequate ventilation if tarping, and this method will work for you. I use deep litter in my coop, which my hens only use at night – they free range during the day. I have not had to do a clean yet, and they’ve been sleeping in there for around 6 months. There is no smell, the shavings are still nice and dry and they have already started to break down. The chickens love scratching in it. I rake it over maybe twice a week and add extra wood shavings on the parts most soiled. It’s so easy! Why make life difficult??? The deep litter method works for me down here in Cooyal, a country town in New South Wales, Australia. No smell and keeps the foot feathers on my Belgian d’Uccle clean. Didn’t work with my setup in the climate. Ended up with tons of maggots in the litter. It was horrible! The chickens are free run now and have a shed converted to a coop just for eggs. A little straw and vinyl sheet on the floor. Good to go now. Glad that mess is behind me. Yikes about the maggots! Gross! We live in the Northwest, near Portland. I have been using the Deep Litter Method and am a big believer in it. I feel we really have happier chickens and think the ease and low odor, along with the health benefits that we see in this method are great. We have taken it to a higher level however. We found a source that sells Industrial Hemp in place of Pine shavings, and the difference is unbelievable. The Hemp bedding seems to be 4 to 5 times more absorbent, and is dust free. Like you said in the article, our chickens do most of the work by stirring it looking for the treats we add occasionally. Right now, I am at 8 months with no clean out, and if we don’t go a year and a half without replacing……it will surprise me. The Hemp is more expensive, but only on the initial set up. In the long run, cheaper and nicer. I never heard of hemp shavings. I’ll have to look into it!